Swainson’s Hawks migrate in large flocks to their wintering grounds in South America, and they can often be seen soaring with other migratory raptors such as Broad-winged Hawks and Turkey Vultures. Particularly during migration, Swainson's Hawks can be quite gregarious and they are often seen congregating in huge numbers at a good food supply. 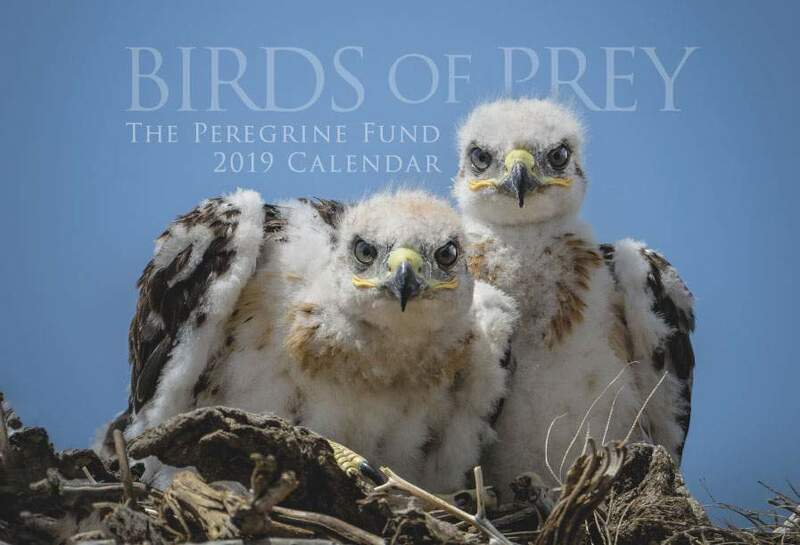 Though The Peregrine Fund doesn't work directly with Swainson's Hawks, our efforts in scientific research, habitat conservation, education, and community development help conserve birds of prey on a global scale. We also supply literature to researchers from our avian research library, which helps scientists around the world gather and share important information on raptor conservation. Swainson's Hawks are found throughout the Americas, dividing their time between the northern and southern regions, depending on the time of year. They summer in North America and can be found from east-central Alaska and Canada (including British Columbia) south through the United States (east to Minnesota) to southern California and northern Mexico (inlcuding Chihuahua and Durango). This lovely hawk winters in eastern South America and can be seen in Argentina, Paraguay, and southern Brazil. Although the majority of Swainson's hawks do migrate like clockwork between the northern and southern hemispheres, some have been found wintering in California, Texas, Mexico, and Central America. Similar to the Northern Harrier, the medium-sized Swainson's Hawk lives in open areas, including savannas, grasslands, steppes, and cultivated lands. Luckily, they only require a small thicket of trees, or even a lone yucca, for nesting. The Swainson's Hawk is a medium-sized raptor, overall similar in size to another common North American species: the Red-tailed Hawk. Swainson's Hawks are beautiful raptors that come in two different color patterns: light morph and dark morph. Light-morph hawks, as the name implies, tend to be lighter-colored overall. In the case of the Swainson's Hawk, light morph individuals have cream-colored, often mottled breasts with a reddish band across their upper breast and a distinctive white throat patch. Dark morph individuals are a uniform chocolate brown overall, except for lighter-colored band on their tails. The Swainson's Hawk is a long-distance migrant extraordinaire! Traveling around 6,000 miles (more than 9,600 km) each way, it undertakes one of the longest migrations of any North American bird of prey. No matter where this hawk travels, one thing is for sure. The Swainson’s Hawk is a friend to farmers throughout the Americas. These birds of prey are often seen in freshly mown fields, feasting on grasshoppers and other insects that can be detrimental to crops. According to recent data from the Veracruz River of Raptors, scientists believe that there are more than 800,000 individual Swainson's Hawks. Though this might seem like a big number, Swainson's Hawks are facing some major threats both in their breeding and wintering grounds and even in places in between. In many areas where Swainsons' Hawks live or travel through, habitat loss and attempts to control grasshoppers and locusts – some of their main prey items – are taking a toll on this lovely raptor. 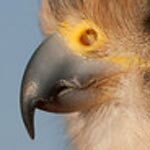 Because they are long-distance migrants, Swainson's Hawks may be exposed to a wider variety of threats. For example, in Argentina, farmers had tried to control grasshoppers and locusts with pesticides. Though these pesticides were banned in many countries throughout the hawk's range, they were still being used in Argentina. When the hawks arrived in this area, they were poisoned in large numbers when they came into direct contact with pesticides or when they ate infected insects. Shooting, electrocution on power lines, and collisions are also some problems this species may encounter. In contrast to the large-footed Orange-breasted Falcon, Swainson's Hawks have relatively small feet, compared to raptors of similar size. As you may have guessed, small feet means they hunt relatively small prey. They feed mainly on insects such as grasshoppers, locusts, and beetles at most times during the year. However, their diet changes during breeding season when they are responsible for feeding fast-growing chicks. As you can imagine, it would take a lot insects to feed even just one young hawk. At this time, they more often hunt bats, mice, ground squirrels, young rabbits, birds such as mallards and sage grouse and a variety of snakes. 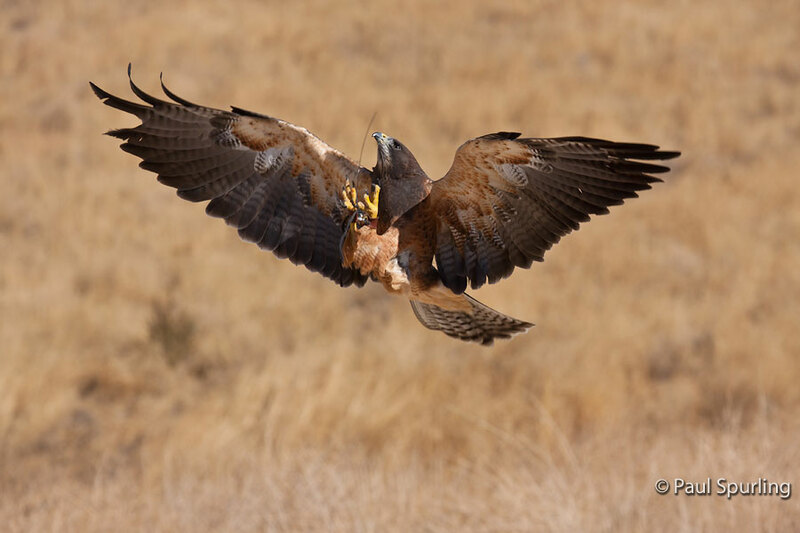 Swainson's Hawks have been known to hunt other, smaller raptors including American Kestrels and even, when the opportunity arises, young Aplomado Falcons. Swainson's Hawks engage in a number of different hunting techniques. 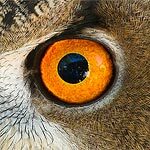 When capturing insects, they often glide through the air, snatching morsels of food out of the sky with their talons and immediately transferring the food to their bills to eat while in flight. They may also capture prey while walking along the ground. Another hunting technique they employ is swooping down from a perch to surprise their quarry. Swainsons's Hawks have been known to hunt in teams. They also are well-known for foraging at grass fires and following behind tractors to catch any animals fleeing from the flames or the sharp blades of heavy machinery. Scientists believe that Swainson's Hawks are monogomous and usually return to the same nest site year after year. Whether they build a new nest or refurbish an old one, the nest is a platform made of large sticks with twigs, weeds, or grass, lined with inner bark and fresh green leaves from surrounding trees Some have flower clusters of willows, lichens, or down or feathers shed by the hawk. They may be found nesting on power poles, in isolated trees, or a low bush or shrub in riaprian areas, grasslands, or even agriculural fields. The female will usually lay 2-3 eggs that are pale blue or green with light brown spots. The eggs must be incubated for around 30 days and both parents help in the incubation duties. When they hatch, the chicks are covered in soft white down. Over the next few weeks, their feathers will grow in gradually and by 6 weeks they will be almost fully feathered and ready to fledge, or fly for the first time. Both parents help feed the young until they disperse from their parents' territory roughly 4-5 weeks after fledging. The Idaho Fish and Game Department estimates there to be more than 16,500 breeding pairs of Swainson's Hawks in the state. 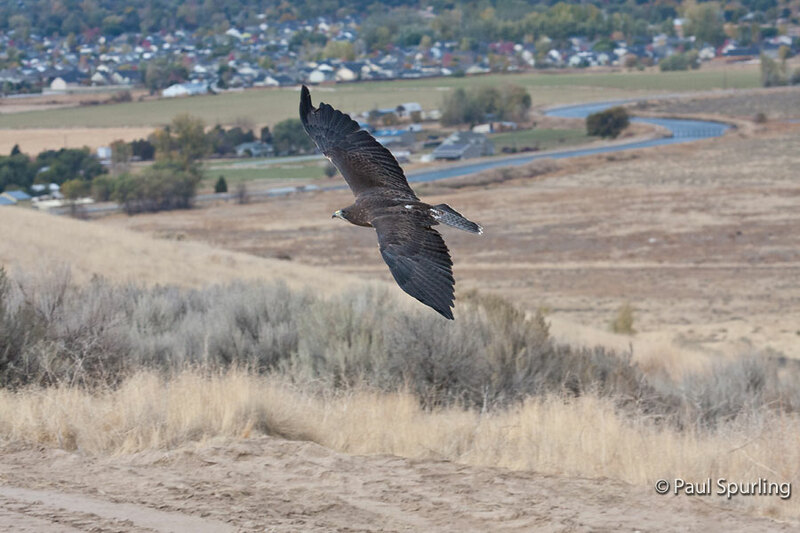 They nest mostly in the southern part of Idaho, namely along the Snake River. They also nest in parts of northwestern Idaho. After breeding season, usually by the middle of September, the Swainson's Hawks leave Idaho and begin their long journey south for the winter. Local biologists have seen that loss of habitat – namely the conversion of sage plains to agricultural fields – as well as programs to control grasshopper populations (one of this hawk's main prey items) are having a negative affect on the species' population in Idaho. 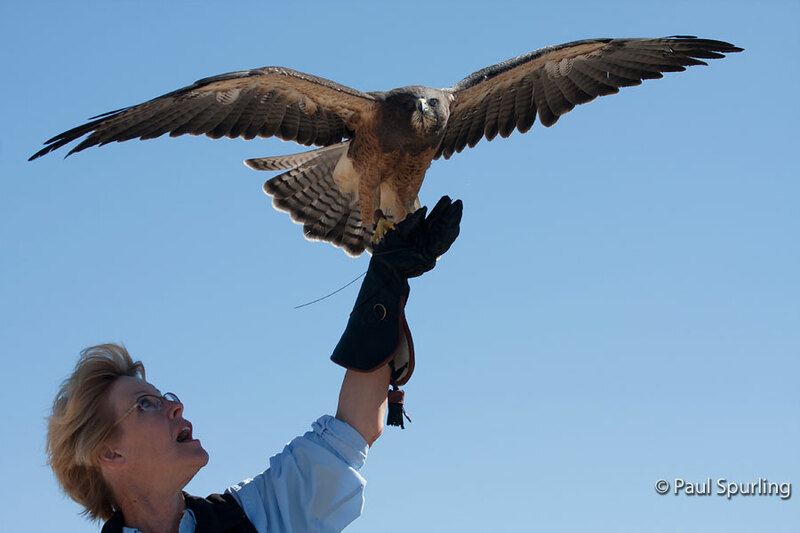 Come to the World Center for Birds of Prey and meet a Swainson's Hawk up close! Hatched in 2007, Griffin was rescued as a 2-week-old chick. We carefully hand-raised her and she is comfortable around people. She wows visitors at flight demonstrations and impresses people with her skill at catching objects in the air, making her an excellent ambassador for a common and often overlooked bird of prey. Griffin is one of more than 20 education birds you can see at the World Center for Birds of Prey. Wild Swainson's Hawks are quite common around The Peregrine Fund's World Center for Birds of Prey – watch for them as you drive up to the entrance as they are often perched on fence posts or soaring low over the grassy fields on either side of the road. When walking our nature trail, be sure to look for them soaring high in the sky. An interpretive sign at the end of the trail teaches you how to identify a raptor based on its silhouette.